Franklin, WI (November 28, 2018) – International manufacturing executive, Russ Dudan, is joining local machined parts manufacturer, Allis Roller, as their new VP of Operations. 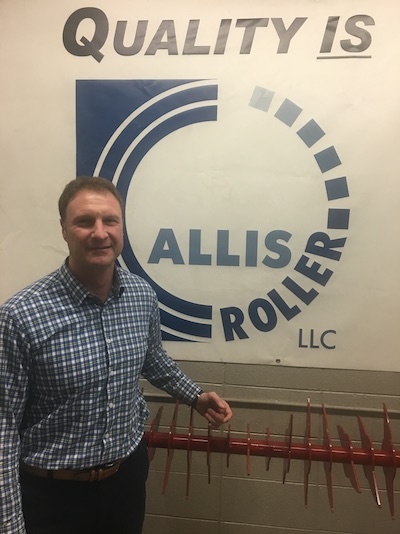 This is the second hire in the last six months that Allis Roller has made specifically to enhance their lean manufacturing business model, foster sustainable growth, and reduce waste. The precision machined parts manufacturer currently serves an expanding list of Fortune 500 customers including John Deere and CNH. Recently, their substantial growth into domestic and global markets has required the assistance of both lean manufacturing and international business expertise. It’s about building relationships based on trust and consistency. Over the course of my career, I’ve had the opportunity to facilitate relationships with businesses all over the world, and build effective teams here at home that can meet the needs and expectations of global customers. I operate using the formula of having the right people, operating with robust processes, and then add technology and/or automation to drive efficiency along with the PDSA cycle to fine-tune those elements continually. Allis Roller’s success thus far is a testament to their commitment to excellence and the growth of Wisconsin manufacturing. Russ Dudan’s contribution will assist in the operation’s continued sustainable growth. Russ Dudan is an experienced international business and manufacturing professional, who has held positions in Operations and Engineering Leadership, General Management, Business Development, and served CEO/President over the course of his career. He has managed multiple operations and built relationships with Fortune 100 companies spanning six continents. Russ is passionate about helping manufacturing operations solve problems, achieve excellence, and grow sustainably.